It may seem like good news the bill was pulled from the consideration, but far-left Democrats wanted more nondefense discretionary spending added to the bill. Rep. Pramila Jayapal (D-Wash.) filed an amendment for parity, which would increase the nondefense discretionary spending caps by an additional $67 billion to match the defense discretionary cap levels. If the amendment was adopted, H.R. 2021 would bust the spending caps by $427.8 billion over two fiscal years. 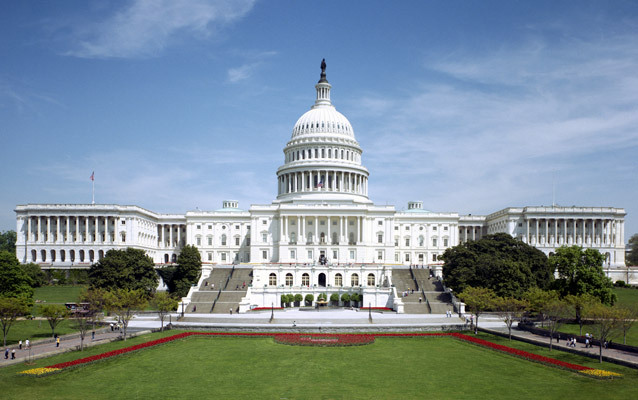 To give some background, Congress passed the Budget Control Act in 2011. This was the product of bipartisan negotiations between President Barack Obama and Speaker John Boehner (R-Ohio) to reduce the budget deficit and immediately increase the debt limit by $400 billion. Spending had grown rapidly as the Obama administration and a Democratic-controlled Congress employed neo-Keynesian economic ideas to try to spend America’s way out of the Great Recession. The United States saw budget deficits of more than $1 trillion for four consecutive years, between FY 2009 and FY 2012. The deficit as a percentage of gross domestic product reached a peak of 9.8 percent during this time frame. Until the Tax Cuts and Jobs Act of 2017, the Budget Control Act of 2011 was the most notable accomplishment of the Republican majorities between 2011 and 2019. What has happened since this law was enacted has been a tremendous disappointment. 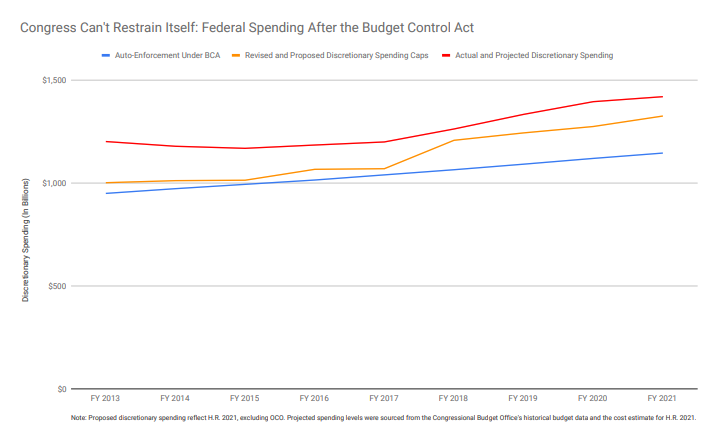 The deficit reduction part of the Budget Control Act set defined levels for discretionary spending and created the Joint Select Committee on Deficit Reduction, which was tasked under the law to develop a deficit reduction package of $1.5 trillion for FY 2012 through FY 2021. The package would receive expedited consideration in Congress. If the so-called “super committee” failed to agree on a deficit reduction package of at least $1.2 trillion, split evenly between defense and nondefense discretionary spending, an enforcement mechanism called sequestration would kick in to reduce defense and nondefense discretionary spending. The Joint Select Committee on Deficit Reduction held five hearings but was unable to reach an agreement on a package, which triggered the enforcement mechanism that reduced discretionary spending between FY 2013 and FY 2021. The bipartisan support for the Budget Control Act didn’t last. With the 2001 and 2003 tax cuts slated to expire at the end of 2012 and the auto-enforcement of discretionary spending caps to limit federal spending set to take effect, the Obama administration and Congress panicked about a “fiscal cliff.” In January 2013, Congress passed the American Taxpayer Relief Act, which briefly delayed the reductions in discretionary spending. In December 2013, Congress passed the Bipartisan Budget Act, a product of negotiations between House Budget Committee Chairman Paul Ryan (R-Wis.) and Senate Budget Chairwoman Patty Murray (D-Wash.). 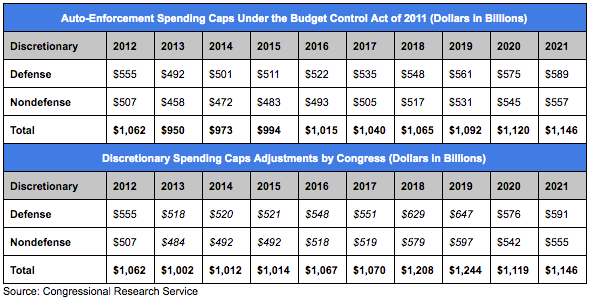 The bill busted the discretionary spending caps for FY 2014 and FY 2015. In 2015, Congress passed another budget that busted the discretionary spending caps for FY 2016 and FY 2017. Finally, just last year, Congress passed the Bipartisan Budget Act of 2018, which busted the discretionary spending caps by $296 billion over two years. Congress has also routinely used the Overseas Contingency Operations (OCO) fund to bypass the discretionary spending caps for defense. Although OCO isn’t off-budget spending, like Social Security or the Postal Service, the money spent through OCO doesn’t count toward the discretionary spending caps, but it does result in higher discretionary spending. This brings us back to House Democrats’ spending caps proposal, H.R. 2021. House Democratic leaders may have decided to pull the bill from consideration on the floor, but Fox News reporter Chad Pergram tweeted on Tuesday that Senate Majority Leader Mitch McConnell (R-Ky.) is talking to Speaker Nancy Pelosi (D-Calif.) about another deal to increase the discretionary spending caps to avoid the enforcement of the Budget Control Act. This will, of course, mean higher discretionary spending levels and larger budget deficits. When Republican and Democratic leadership get together to come to an agreement, it is usually for the worse, not for the better. Unfortunately, with yet another caps deal, this seems to once again be the case.